The Firefly OverSleeve is a universal, one-product-fits-all solution for the firestopping of insulated metal pipes. The thin and flexible intumescent is quickly and simply wrapped directly on top of pipe insulation without the need to cut back, ensuring that thermal and vapour seal performance in maintained. The red branded foil can be easily checked and identified on site to confirm that firestopping is in place. The unique Firefly intumescent material rapidly expands to crush and seal off the insulation to provide up to 120 minutes fire resistance to pipes ranging from 15mm up to 219mm diameter. The red branded foil can be easily checked and identified on site to confirm that firestopping is in place. 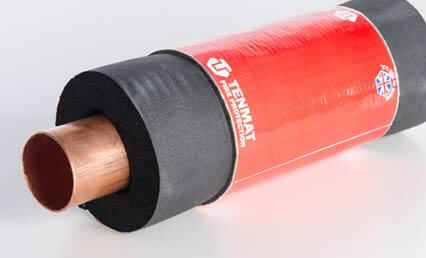 The unique Firefly intumescent material rapidly expands to crush and seal off the insulation to provide up to 120 minutes fire resistance to pipes ranging from 15mm up to 219mm diameter.